We are wary of festivals because of the toll they take on water bodies in general and our lake in particular. Navaratri, however, became special for us since 2013 when a South City resident Raji decided to make our Puttenahalli Lake part of her “Golu.” Invited for haldi kumkum, we walked in and stopped short. What? Our Lake in the Golu? The lake made of chart paper and little figures was almost an exact replica of Puttenahalli Lake. Raji and her son Aditya had anticipated it full of water and their model had an expanse of blue when in reality the lake bed was more green with weeds. This unusual representation during a festival of dolls caught the eye of the press and Jagran City Plus carried this story. At Navaratri last year we had another heartwarming surprise when a Brigade Millennium resident, Anjana Shivakumar decided to revere Mother Nature by donating to PNLIT the money she would otherwise have spent on gifts for her haldi kumkum guests. We returned her kind gesture by “gifting” her and her 40 odd friends with an Indian Rosewood (Sheesham) growing tall and stately in the Viewing Deck. You can read this story here. 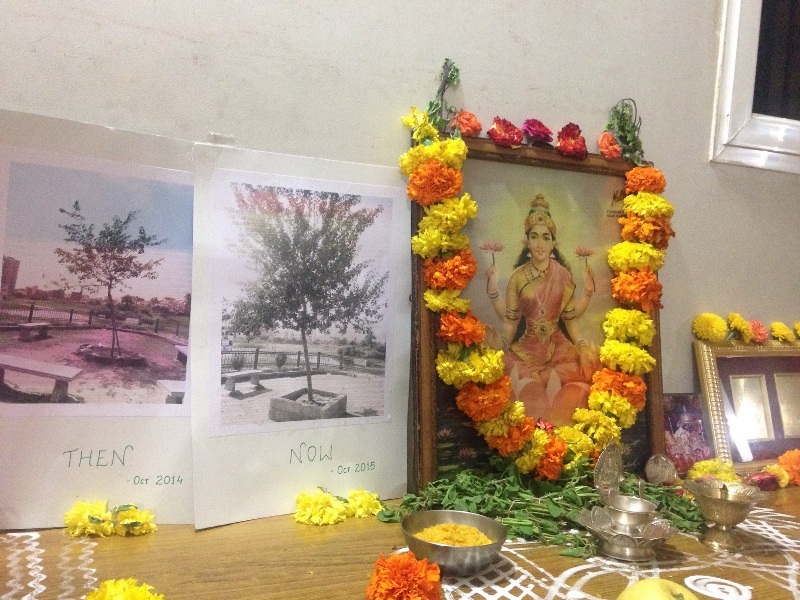 This year Anjana has once again decided to pay her respects to Nature, the Supreme Mother, through Puttenahalli Lake. The photograph above shows the pride of place Anjana has given the lake and also indeed, how much the Sheesham has grown in this one year. Raji’s dream of seeing the lake full of water is also slowly and steadily becoming a reality with the inflow of excess treated water from South City Sewage Treatment Plant. Our major challenge now is to remove the invasive alligator weed and reveal the water in all its glory for our communities of humans and birds. This is a huge challenge and expensive as well but with the prayers of people like Anjana and Raji directed towards the welfare of the lake, we shall overcome this hurdle.